Your van is like another member of staff and you need it to be working to its maximum potential, which is why we're offering you the chance to scrap your old van and we'll give you £2,000 which can be put towards a new Renault Trafic Business or Renault Trafic Sport Nav*. In order to qualify for our Scrappage Scheme, your van must have been registered on or before the 31st December 2010 and you must have owned it for 90 days or more. You could soon be driving a more efficient Euro 6 van which will reduce your CO2 emissions and make you exempt from the London T-Charge. HOW MUCH IS MY VAN WORTH? *Scrappage offer available to only when you trade in any van registered before 31 December 2010. Trade in vehicle must be registered to the customer for at least 90 days before the new vehicle contract date. 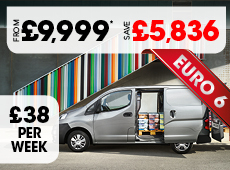 Offer only available on Renault Trafic Business and Trafic Sport Nav models. UK residents (excl. Channel Islands) and over 18s only. Finance lease figures are subject to status and have a final payment to be made.